One thing I just love about living in a city is the density of interesting things I encounter just by chance. I guess any city is like this, but a city that’s new to me obviously feels like it has more new stuff. And Bangkok is especially so. I think that’s because there are so many things going on in the streets that take up less space than things in America. In Denver, you never run into a business that takes up less than about 50 square meters. But here, a business can be as small as a 1 square meter cart, and stuff is packed into smaller spaces than in most of America. Lumpini Park is a major public park in Bangkok, just east of the Bangrak (aka Bang Rak) area. It’s easy to get to by BTS. Lots happens there, as with a big park in any city. But since there’s no snow in Bangkok, stuff happens in Lumpini Park even in the middle of “winter”. 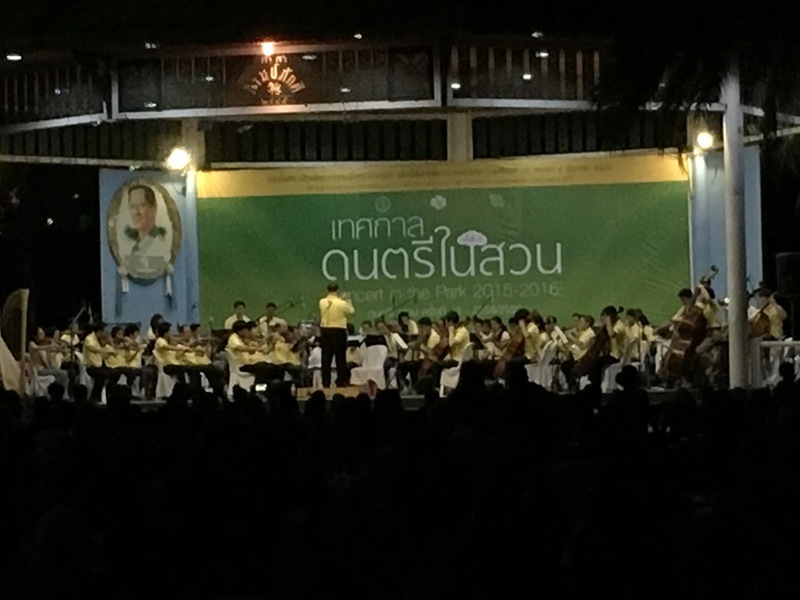 We read about a series of free concerts in Lumpini Park every Sunday night. From doing a little online research, I learned than these concerts are by the Bangkok Symphony Orchestra. So hey, free culture! Sunday had been rainy in the morning, which cooled things down immensely. But the sky cleared up by afternoon, and so we headed for the BTS station. On the way, we gathered up various bits of food from food carts along the way. And when we got enough of it assembled, I realized that our picnic supper looked a lot like a picnic in America. We had fried spring rolls (OK, that’s not very American), corn on the cob, and fried chicken. We didn’t have a picnic blanket, but I brought my Marmot Goretex jacket which would be good enough if we needed it. After the short train ride, we walked into the park past the statue at the entrance of King Rama VI, who created the park back in the 1920s. There were even more food carts there, and I couldn’t resist stopping for a shave ice. I got orange flavor with sweetened condensed milk on top, in the Asian style. The guy’s ice shaver was totally old school: a big block of ice on a hand-cranked turntable and a metal blade. 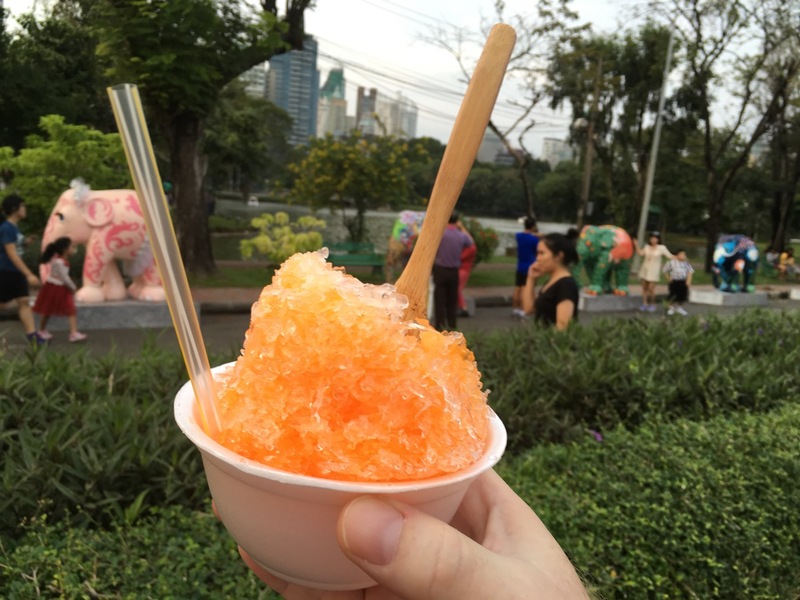 The resulting grains of ice were bigger than Hawaiian style shave ice, and it was more like an American snow cone. 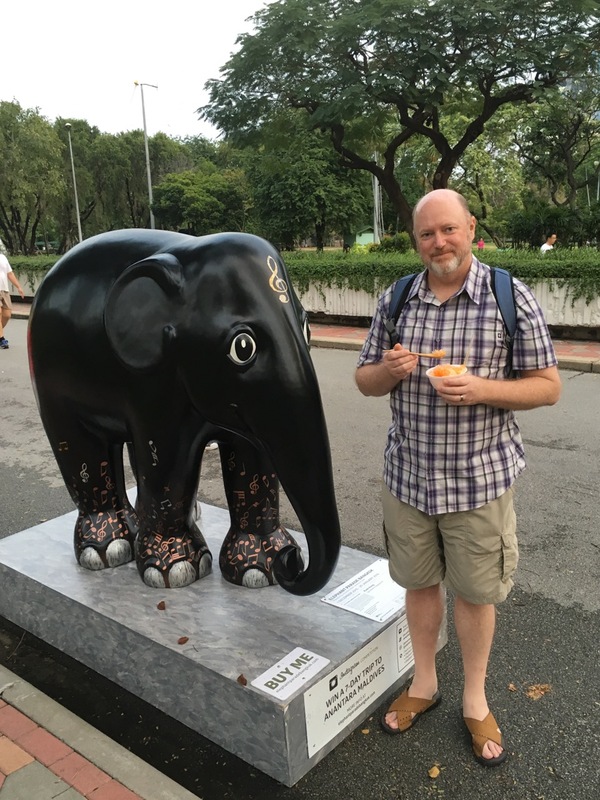 After that, we discovered an art display of a bunch of elephant statues. From what I could understand, different groups or companies submitted their own elephants as a way to show their uniqueness or represent some cause or another. Some of the organizations did things as boring as just putting their company logo on the side of the statue. Others modified the standard statue and painted it with a custom design. For instance, I remember one elephant was a land mine survivor and had a prosthetic foot. This elephant caught my eye because it is clearly a representation of Spinal Tap’s first album. None more black. And music symbols. 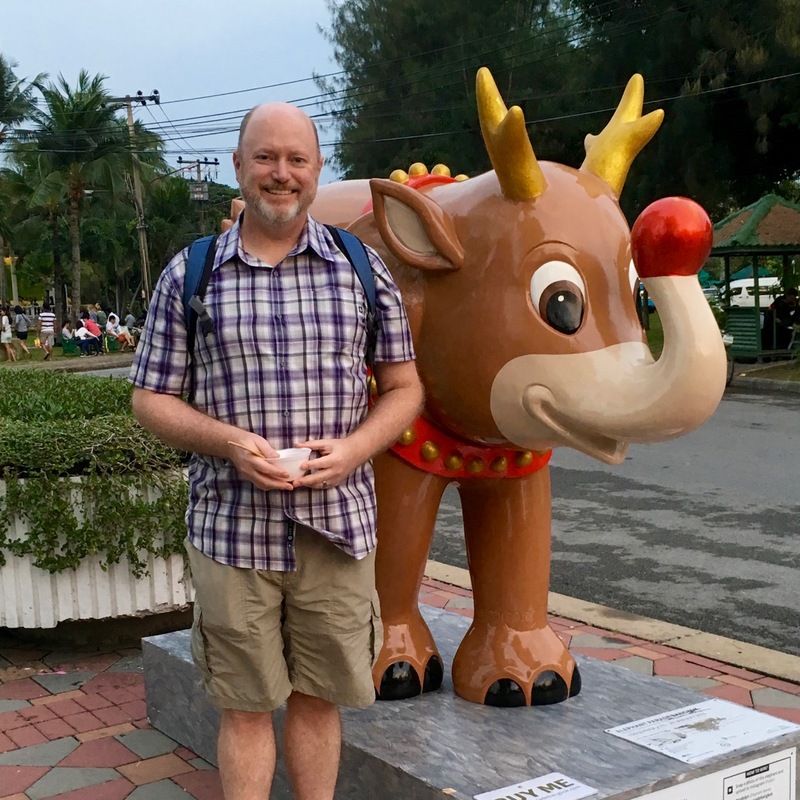 But then I saw Rudolph the Red-Nosed Reindeer as an elephant and had to get a photo next to it. The concert was supposed to start at 5:30pm, and we could hear the music off in the distance, so we knew we were late. But then the bells sounded to indicate that it was 6:00pm. And you know what happens every morning and eight and every night at six in Thailand, right? The national anthem is played, and everybody stops in their tracks and stands. It was eerie, since this was the first time I’d seen it. Everyone who had been walking to or from the concert, or checking out the elephant statues, or playing games just suddenly froze like in the world’s largest game of freeze tag. When the music ended, the bells played again, and everyone suddenly unfroze and went back to whatever they were doing. It’s weird that in all the time we’ve spent in Thailand now, roughly five or six weeks, I haven’t been in public at either 8:00am or 6:00pm to witness this. I didn’t take video of the event, but I found a couple YouTube videos of it that other people made. Once the anthem was over, we made our way to the area where the concert was going on. There were yet more food stalls there, but we didn’t need anything else. Since the turf was water logged, we found a section of unoccupied curb and sat there listening to the music and eating our picnic. The fried chicken vendor near the east entrance to the Saphan Taksin BTS station makes the most incredible fried chicken. I don’t know what herbs and spices he uses, but I daresay his are better than the venerable and inscrutable Colonel Sanders. The music was a mix of vocal and instrumental pieces, and a mix of Western and Thai. They played some Thai pop songs from past eras and also a tune or two from Les Miserables. One thing I thought was strange was that the attire of the orchestra was very casual. Some musicians wore blue jeans, some wore black slacks, some wore skirts. Most, though not all, wore yellow polo shirts like the one the conductor is wearing in the photo above. In hindsight, even though this whole evening was supposed to be about the concert, the concert itself was the least significant thing. Watching all the people, seeing the art, and enjoying the park were what I’ll remember most.